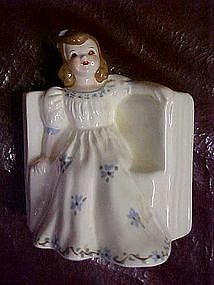 This little lady appears to sit on a bench with a wall in the back, which is the planter part of the vase. She is hand painted, glazed pottery and marked Florence ceramics, Pasadena, California. She is part of the Garden girl series, She wears a cream dress with little blue flowers. She is in perfect condition! She measures 5 1/2" tall.